--Ann Patchett, author and owner of Parnassus Books, Nashville, Tenn., in an interview with the Bookseller. She has also written an essay, "The Bookshop Strikes Back," which is being sold exclusively through independent bookshops as part of the U.K.'s upcoming Independent Booksellers Week (June 29 to July 6). Waterstones is preparing for a store management restructuring that aims "to put more emphasis on traditional shop floor bookselling," the Bookseller reported. In an e-mail to staff, managing director James Daunt said that the roles of branch manager, assistant manager, general manager and deputy manager will be abolished, to be replaced by a new position called bookshop manager that will encompass those roles. The approximately 560 people affected will enter a consultation, which means they will be let go unless another job is found. The Bookseller commented, "It is not clear how many members of staff will leave the company. Existing managers will be able to apply for the new role and there may be multiple bookshop managers at some stores." Daunt wrote: "It is particularly important that we do this because more than ever before our managers will be central to our ability to deliver effective bookshops: the decisions that define the character of our bookshops will fall to them in the new role." Daunt added, "Sales are robust, costs and operational process greatly improved and the net performance of Waterstones has made a step-change for the better. The substantial part of this improvement is down to your individual and collective effort. The context, however, is the current unforgiving bookselling environment. We may be running better bookshops, and running these in a very different manner to before, but we have yet to recognise this in our management structure. If we are to secure the future of Waterstones, we must take the difficult step to do so." In February, Waterstones restructured its regional management, creating the role of retail manager and letting go seven regional and divisional managers. In the first quarter ended April 30, total revenues at Hastings Entertainment fell 5.5%, to $109.1 million, and the net loss was $2.2 million, compared to a net gain of $833,000 in the same period in 2012. 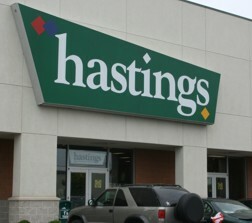 As of April 30, Hastings operated four fewer superstores compared to a year earlier. Sales of books at stores open at least a year fell 8.4%, the company said, "primarily due to a weaker new release schedule for new books as compared to the first quarter of fiscal 2012, which included strong sales from the Hunger Games trilogy." Music, games and consumables also had sales drops during the quarter. Chairman and CEO John H. Marmaduke commented: "Our revenues continue to be negatively impacted by the popularity of digital delivery, rental kiosks and subscription based services, as well as the longevity of the current video game console life-cycle." In response, the company has introduced new product categories that include consumer electronics, music electronics and accessories, hobby, recreation and lifestyle, vinyl and tablets, most of which are sold in the electronics area, whose comp-store sales gain was 18.4% in the quarter. Hastings is in the process of "resetting" its stores to emphasize these new products; by the end of the fiscal year, 104 of its 134 stores will be reset. 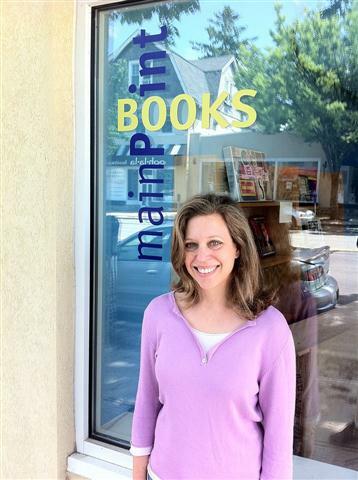 Main Point Books is opening in Bryn Mawr, Pa., a week from today, May 28, the Philadelphia Business Journal reported. Owner Cathy Fiebach is a graduate of the University of Pennsylvania and the Wharton business school who has had a career in marketing and brand management. The 1,700-square-foot general store will be on West Lancaster Avenue. 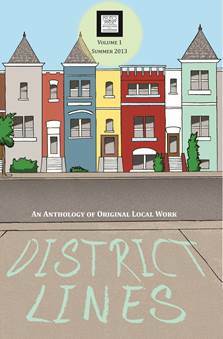 The first issue of District Lines, Politics & Prose Bookstore's new quarterly literary anthology series, went on sale yesterday. District Lines contains fiction, nonfiction, poems and photography from artists living in and around Washington, D.C., and is printed on P&P's Espresso Book Machine, Opus. Contributors to the inaugural issue include poets Joseph Ross and Sandra Beasley, along with Anna El-Eini, Linda Pastan and several others. Subjects range, the store said, "from a sighting of Effi Barry on a Metro bus to an August night on the Q Street Bridge to hotcakes at the Florida Avenue Grill to an ode to the Dupont Circle metro escalator." The anthology was edited by Susan Coll, an author and Politics & Prose's director of programs and events, who said, "We really wanted to capture a sense of people and place in D.C. and the surrounding area. 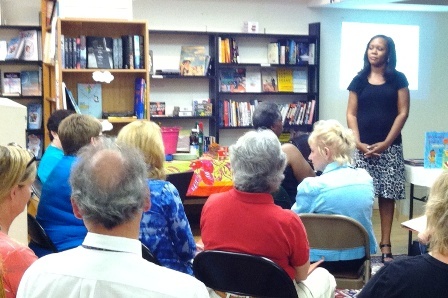 District Lines provides a forum to showcase the vibrant D.C. literary community." On June 15, Politics & Prose will host a reading featuring contributing writers. District Lines is $15 and available at Politics & Prose. Coffee House Press has launched the Writers and Readers Library Residency program, which aims to connect authors with libraries and collections across the country. The authors will work to create new essays, fiction, poems and even book reports in conjunction with their respective collections. Additionally, the authors will offer accounts of their day-to-day activities on the Coffee House Press blog and the blogs of their given institutions. The program's goal is to "create a body of work that will inspire a broader public to engage with their local libraries in a new and meaningful way, and to encourage artists and the general public to think about libraries as creative spaces." The program begins this summer in Minneapolis, at the Walker Art Center's library, with poet Lightsey Darst, author of Find the Girl and Dance, as the first writer-in-residence. "We want to help develop a new vision for literature's role in the public arena," said Chris Fischbach, publisher of Coffee House Press. "For our writers, we want to open doors to rich, cultural spaces and to create an opportunity for a sort of institutional collaboration." Coffee House Press is working to put authors in residence at the American Craft Council, Midway Contemporary Art Library and the Minnesota Historical Society. The residency program is part of Coffee House Press's broader Books in Action initiative, through which the publishing house seeks to "publish works and develop programs that encourage and nurture literary art beyond the page." 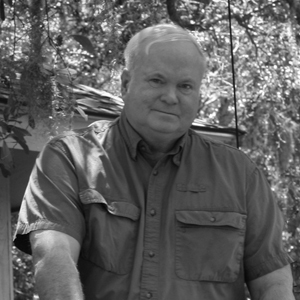 Author Pat Conroy will serve as editor-at-large of Story River Books, a new imprint the University of South Carolina Press will begin publishing next year, the Free Times reported. The series will focus on original novels and short story collections with a South Carolina focus and include state writers representing a range of race, gender and geography, the publisher said, adding that the books "will collectively present new perspectives on the dynamic, complex and oft-contested past and present of a recognizable South Carolina." "I've watched South Carolina produce a distinguished crop of writers, both homegrown and legal immigrants like me," Conroy said. "This state has created a powerful literary voice." The Country Bookshop in Southern Pines, N.C., which will celebrate 60 years in business in September, rounded up Children's Book Week celebrations with a writing workshop featuring Kelly Starling Lyons, author of Ellen's Broom, which was a Coretta Scott King illustrator honor book. Books of Wonder and the Society of Children's Book Writers and Illustrators are hosting an open house for booksellers, authors and artists on Tuesday, May 28, from 5-8 p.m. at Books of Wonder, the children's bookstore, at 18 W. 18th St. between 5th and 6th Avenues. "Authors and artists always have to be 'on' when they're the guests of honor at publishers' BEA parties," Books of Wonder owner and founder Peter Glassman said. "The idea here is for them to just relax, have fun, and meet the booksellers who are their true partners in getting their books into the hands of their readers." SCBWI's executive director Lin Oliver added, "The partnership between authors and illustrators and booksellers is the basis of our business. Having events like this where we can get to know and appreciate one another is a rare treat. Long live Books of Wonder!" All the more reason to go to the PGW party! The Book Industry Charitable Foundation, aka Binc, has been selected as the designated charity for the PGW party, which will be held at Le Poisson Rouge on Friday evening. (Invitations must be requested at PGW's booth, #1226.) 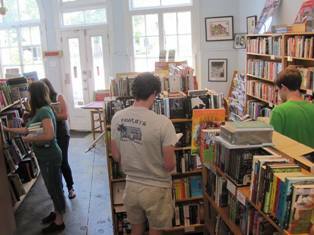 Donations will benefit bookstore employees who are facing unexpected financial emergencies. Cal Morgan, publisher of It Books for two years, is joining the group full time as senior v-p, executive editor; he continues as editorial director of Harper Perennial and Harper paperbacks. Lynn Grady has been promoted to senior v-p and publisher of It Books. She continues as deputy publisher of Morrow/Voyager/Avon Books. As a result of the changes, It Books and Newmarket Press are reporting to the Morrow division, and Harper Design reports to the Harper division. From the Facebook page of Avid Bookshop, Athens, Ga., yesterday: "We're closed today, but that doesn't mean we're not working! Our new booksellers are doing an intensive training today. Right now each bookseller is picking out some favorite books and has the challenge of 'selling' the books to the rest of Avid booksellers. We ♥ our staff!" Doug Stambaugh has been promoted to Simon & Schuster's v-p of global e-book market development and strategy, a new position. Stambaugh will now oversee S&S's entry into an increasingly diverse array of digital markets, helping with everything from digital rights management strategies to expanding non-retail partnerships with schools and libraries. Stambaugh has been with Simon & Schuster Digital since 2007, most recently as v-p of business development. He helped finalize e-book agreements with all the company's major retailers in the U.S., Canada, the U.K., Australia and the Open Market and was instrumental in launching S&S's pilot e-lending program with three New York area libraries. Kelly Burdick has been named associate publisher of Melville House. He has been with the company since 2005 and was most recently executive editor. Besides founders and publishers Valerie Merians and Dennis Johnson, Burdick is the senior employee at Melville House. "I remember his first day with us," Johnson said. "He volunteered to help us at an event we were staging in the Great Hall at Cooper Union--an 'anti-inauguration' on the day of George Bush's second inauguration. At that point, the company's only employees were Valerie and me. We thought we couldn't afford to hire anyone, but Kelly was so smart and so intuitive about publishing that we decided we couldn't afford to let him go." The New York Times' "Neighborhood Joint" series featured a slide show tour of Logos Bookstore, noting: "After serving a midtown clientele on Madison Avenue for twenty years, Logos moved to York Street in 1995 and became a community bookshop for locals looking for religious books, fiction, holiday cards, or chats about life and faith." Regarding the absent letter on the store's sign, owner Harris Healy recalled: "Some months ago a customer said, Hey, you lost your 'o'! I guess I swept it up and threw it away by accident." TGS International, Berlin, Ohio, a publisher of Christian books and other Christian material, is being distributed to general trade booksellers by Bookmasters. A for-profit subsidiary of Christian Aid Ministries, TGS International was created to provide a channel for individuals and organizations to send relief supplies to needy recipients in Eastern Europe. TGS International published its first book, 101 Favorite Stories from the Bible, in 1995. He's Gone by Deb Caletti (Bantam), a National Book Award Finalist for her previous YA novels. This morning on MSNBC's Morning Joe: Deepak Chopra and Sanjiv Chopra, authors of Brotherhood: Dharma, Destiny, and the American Dream (New Harvest, $28, 9780544032101). Tomorrow morning on MSNBC's Morning Joe: Khaled Hosseini, author of And the Mountains Echoed (Riverhead, $28.95, 9781594631764). See the book trailer here. Tomorrow morning on the Today Show: Squire Rushnell, author of Divine Alignment: How Godwink Moments Guide Your Journey (Howard, $14.99, 9781451667776). Tomorrow on CNBC's Squawk Box: Glenn Hubbard and Tim Kane, authors of Balance: The Economics of Great Powers from Ancient Rome to Modern America (Simon & Schuster, $28, 9781476700250). Tomorrow on Bloomberg TV's Money Moves: Pamela Ryckman, author of Stiletto Network: Inside the Women's Power Circles That Are Changing the Face of Business (AMACOM, $22.95, 9780814432532). See the book trailer here. Tomorrow on NPR's Diane Rehm Show: Charles Moore, author of Margaret Thatcher: From Grantham to the Falklands (Knopf, $35, 9780307958945). Tomorrow on Rachael Ray: Nina Blackwood, Mark Goodman, Alan Hunter and Martha Quinn, authors of VJ: The Unplugged Adventures of MTV's First Wave (Atria, $25, 9781451678123). Tomorrow on Al Jazeera: Allen Frances, author of Saving Normal: An Insider's Revolt Against Out-of-Control Psychiatric Diagnosis, DSM-5, Big Pharma, and the Medicalization of Ordinary Life (Morrow, $27.99, 9780062229250). Tomorrow on CBS's the Talk: Art Smith, author of Art Smith's Healthy Comfort: How America's Favorite Celebrity Chef Got it Together, Lost Weight, and Reclaimed His Health (HarperOne, $27.99, 9780062217776). Tomorrow night on the Daily Show: Bill O'Reilly, author of Keep It Pithy: Useful Observations in a Tough World (Crown Archetype, $21.99, 9780385346627). Salinger, Shane Salerno's much-anticipated documentary about reclusive author J.D. Salinger, "has been veiled in mystery and speculation, and has been nine years in the making," the Guardian noted in its account of last week's brief "taster" screening during the Cannes Film Festival. The movie is scheduled for a fall release this year. "Through a bafflingly fast-paced montage of clips, showing fragments of interviews with figures such as Tom Wolfe, E.L. Doctorow and the late Gore Vidal, the preview hinted at, rather than delivered, revelations about the writer's existence after he withdrew from public life in 1965, living in seclusion and no longer publishing though, it is speculated, writing feverishly until his death in 2010," the Guardian wrote. Harvey Weinstein, whose company is handling distribution, was asked if the movie contained any "hard revelations" about Salinger. "It depends how you define a great revelation," he replied. "I hope the audience will keep the secret of the film, and won't tell their neighbors, just like they did for The Crying Game. If I told you what it was they'd kill me. Shane Salerno directed Savages, so I am definitely not going to tell you." Jenny Colgan won the Romantic Novelists' Association's Romantic Novel of the Year award for Welcome to Rosie Hopkins' Sweetshop of Dreams. The judges praised Colgan for "her impeccable plotting and structure." Also presented was the Joan Hessayon Award, which recognizes the best in new writing. This year's winner was Liesel Schwartz for A Conspiracy of Alchemists. Seduction: A Novel of Suspense by M.J. Rose (Atria, $24, 9781451621501). "Seduction transcends time in recounting the story of the tragic loss of Victor Hugo's daughter and his desperate attempts to contact her via séances. Fast forward to the present, when Jacinthe 'Jac' L'Etoile, a mythologist specializing in Celtic lore, probes the secrets of the Isle of Jersey, where Hugo communed with spirits and composed his journal. Rose expertly interweaves mythology, the supernatural, psychoanalysis, and evil incarnate, to create an amazing amalgam of narrative wonder. Certain to satisfy old fans and garner new ones as well." --Lynne Maxwell, Mystery Lovers Bookshop, Oakmont, Pa.
Amity & Sorrow: A Novel by Peggy Riley (Little, Brown, $25.99, 9780316220880). "Amity and Sorrow are sisters, stolen away by their mother, Amaranth, from the only home they've ever known--the compound of their father's polygamous cult in the Idaho Panhandle. After four days of driving, Amaranth crashes their car in Oklahoma, where all three are reluctantly taken in by a dogged descendant of the Dust Bowl. While the sisters and their mother struggle in their new surroundings, Amaranth's story of what lured her into the cult and what ultimately drove her away is unfurled in a series of harrowing flashbacks. A deft debut told with great compassion and insight." --Kim Fox, Schuler Books & Music, Alpine, Mich. The Lower River: A Novel by Paul Theroux (Mariner, $14.95, 9780544002258). "As Ellis Hock nears the end of his long career--and his marriage--he does what many of us do at a time of great change: reassess the trajectory of our lives by going back to a time when we were truly happy. For Ellis that time was in his twenties, when he served as a Peace Corps volunteer in the Lower River of Malawi. He decides to return, but the Africa of his sixties is but a shadow of the Africa he left behind, and the idealism he arrives with quickly vanishes in the desperation that covers his beloved village." --Amanda Hurley, Inkwood Books, Tampa, Fla.
White Fur Flying by Patricia MacLachlan (Margaret K. McElderry Books, $15.99, 9781442421714). "Zoe's mother rescues Great Pyrenees dogs, caring for them until a new home can be found. Across the street, Philip is moving in with his aunt and uncle. Philip doesn't speak, and no one knows why. Up until now, Zoe's family has been rescuing dogs. This time, it may be the dogs that do the rescuing. This simple, poetic story of trust and friendship will steal your heart. A line from the book perfectly describes MacLachlan's writing: '[She] always tells the truth ... even if it is fiction.' 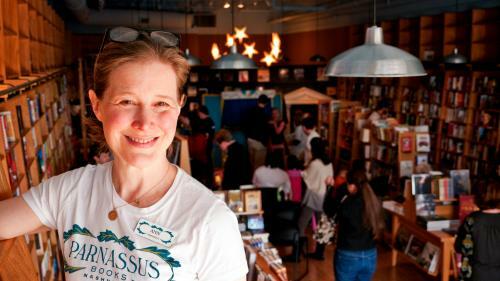 " --Marika McCoola, Odyssey Bookshop, South Hadley, Mass. Two newlyweds, their names never given, build a house on a faraway shore. Like many young couples, they foresee nothing but simplicity and happiness. Together, they create their home, which the wife furnishes with objects sung into existence by her beautiful voice. For a time, all is new and full of promise as they fish in their lake, keep house and expect the birth of their first child, which the husband desires above all things. With doom literally hanging over their heads, the couple undertakes one last gestation, but its result spells disaster not only for their marriage but also for the balance of life in the woods, where a mysterious and powerful bear reigns supreme over all creatures. To restore equilibrium to the land and his love, the husband must journey deep into the earth where his wife now hides, in a labyrinth of rooms filled with the memories of happier times; he must also face the wrath of the Bear and the cunning of a monster who has lived in the lake since time immemorial. Shelf Talker: An allegorical epic about a couple whose magic cannot give them the one thing they want--a child--explores human love and loss via mythic symbolism.